Size: 5.3" x 3.1" x 1.4"
The Bowmar 901D was the first "True-Pocket-Size" calculator using a 10 digit display based on components of the Texas Instruments company. This calculators uses both the original Klixon™ keypad and the TMS0107 Integrated circuit. The remaining part of the calculator is very similar to the earlier Bowmar 901B. 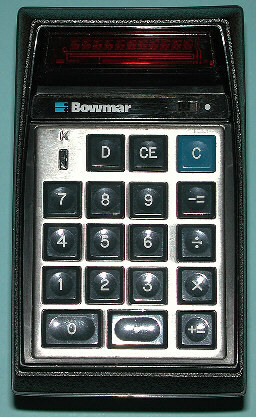 Bowmar Instruments was one of the first casualties of the Calculator Wars and filed in 1976 for bankruptcy. Don't miss a mystery calculator with the Bowmar brand introduced in 1977!